Finally! A guy on the beach who wasn't digging a boring hole. 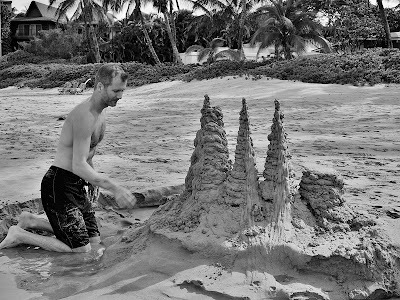 Well, actually he was digging a hole, but only to get wet sand to drip on his spires. I'm still not seeing any clever sand sculptures, but this was definitely a step in the right direction. As for relaxing (?) on a dead tree trunk... I don't think I could ever get comfortable while balancing to keep from falling off - not to mention the splinters. Ouch. That beach looks like our favorite snorkeling beach. Maluaka Beach? Nope, that is Keawakapu beach - but I agree, Maluaka (especially the south end) is incredible snorkeling.